A ban on electric bicycles in New York City is hurting delivery workers who depend on them to earn a living. Many of the workers are immigrants. Electric bicycles, or “e-bikes,” have foot-powered pedals like other bicycles. But they also have electric-powered motors to assist riders in moving the bike forward. Most e-bikes reach speeds of about 32 kilometers an hour, but some can go much faster. Aimin Liu often uses an e-bike to deliver up to 40 Chinese food orders all across Manhattan each day. He is 60 years old. He says an e-bike makes his job much easier. Although it is legal to own e-bikes in New York City, it is not legal to operate them. Officials there cite the dangerous use of e-bikes on streets and sidewalks as reason for the ban. Last year, the city announced severe measures meant to hold e-bike riders and restaurants that employ the riders responsible. E-bike operators can now be fined $500 for violating the ban. Police can also seize the bikes. Aimin Liu says he fears he might physically collapse if he tried to complete his daily work using a normal bicycle. He also estimates he could only deliver about half the number of orders. Zheng, a Chinese delivery worker, repairs his bike on a New York sidewalk. Many of New York's delivery workers are Chinese immigrants in their 50s and 60s. Their job requires them to work quickly and for long hours in order to earn enough money to live on. Delivery worker Deqing Lian said it is important to perform quality work because their job also depends on tips. He added that when delivery workers are too slow, some people refuse to pay for the food. This makes the workers’ supervisors angry. 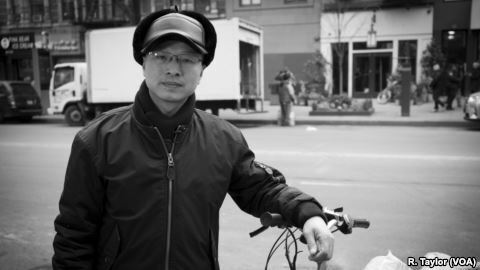 Liqiang Liu is an e-bike delivery worker and spokesperson for the New York Delivery Workers Union. He says being caught violating the ban and having the bike seized would cause costly delays for workers. Liqiang Liu, 45, feels it is his responsibility to stand up for older e-bike delivery workers, many of whom work more than 60 hours per week to earn a livable salary. “We can’t take a day off even we are sick,” he tells VOA. Do Lee is with the Biking Public Project, which provides assistance to bicycle-related workers in New York City. He says the city’s ban on e-bikes is unfairly targeting low-paid workers who largely come from the city’s Latino and Asian communities. He does not accept the argument that e-bikes present a danger to citizens. However, many New Yorkers are quick to blame e-bike riders for not being safe. Many bicycle delivery workers put in 12 hours on an individual shift. But in the off-peak hours, business — and tip-earning — can be slower. New Yorker Bill McGowan says he has mixed feelings about e-bikers in the city. Ramon Taylor and Ye Yuan reported this story for VOA News. Bryan Lynn adapted it for Learning English. Ashley Thompson was the editor. pedestrian – n. a person who is walking in a city, along a road, etc.